At eighteen Dylan Rutledge has one obsession: music. He believes his destiny is to be the greatest composer of the rapidly approaching twentieth century. Only Laurence Northcliff, a young history master at The Venerable Bede School for Young Gentlemen, believes in Dylan’s talent and encourages his dream, not realizing Dylan is in love with him. But Dylan’s passion and belief in his future come at a high price. They will alienate him from his family and lead him on a rocky path fraught with disappointment, rejection, and devastating loss that kills his dream. A forbidden love could bring the dream back to life and rescue Dylan from despair and bitterness, but does he have the courage to reach out and take it? Will he deny the music that rules his soul? Many of my favourite artists poured their tortured soul in a sculpture or on a canvas, and I am as saddened by their torment as thrilled by their work. There’s a specific violin concerto that puts me into some kind of transe. One of my favourite songs is titled “La Bohème”. I may roll my eyes at characters going through the 10 Plagues of Egypt before finding their HEA, but I like epic stories, tales of loss and love against all odds, I thrive at resilient characters struggling and snatching victory. I thought I met all the requirements to enjoy a romantic saga featuring a doomed artist fighting for recognition, love and happiness. That’s “Counterpoint” all over : Dylan is a misunderstood composer, a genius who will have to make hard choices for the sake of his music; a lover who will have to face sorrow and trials. Except for one detail. 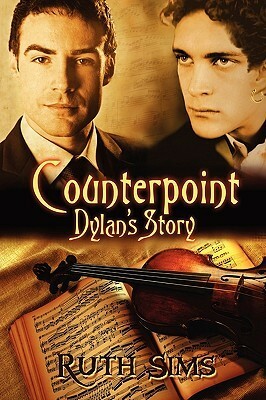 “Counterpoint” is an epic tale allright, but “Counterpoint” is also a melodrama. Ow. I don’t like melodrama. And I don’t use this word as an offensive remark. I refer to the actual genre whose etymology means drama with music (how fitting). Melodrama exaggerates plots that pull on emotional strings. Heros are put through the wringer, innocents are tortured by a cruel fate and wronged by stereotyped villains, the world is black and white and an angst fest. It doesn’t aim at any musical performance, but uses music among other scenery effects to emphasize the drama. In short, melodrama is caracterized by excessiveness, stereotypes and pathos. That is “Counterpoint” all over. Sure, the quiet between two storms had its moments, names and details give this story a stamp of historical authenticity; but from countless tear-jerker plot devices to characters stopping mid-scene to soliloquize their anguished feelings, and the doubts of creation being dealt as a brat’s temper tantrums, this story belongs to this genre. So, wrong reader, wrong book. Actually, a fair amount of five stars and a Rainbow Award show that this book has a fervent readership who loved it as much as I disliked it. It all depends on what triggers your tears and elation; and that would be my conclusion. This entry was posted on November 20, 2014 by BdsP in Historical, Reviewer: Ilhem and tagged 2.5 Stars, dreamspinner, musicians, Ruth Sims.